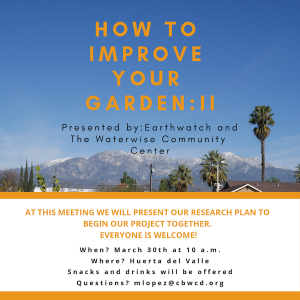 We are excited to announce and invite you to our upcoming workshop, “How to Improve Your Garden,” which will be held on March 30 at 10 am at Huerta del Valle in Ontario, Calif. Through our latest research initiative, the Community Gardens Project, we seek to increase awareness of watering needs in urban gardens and promote water conservation through community science. At this workshop, we will talk about soil moisture sensors, learn which type participants prefer, and offer new irrigation installations to committed participants. Interested community scientist are invited to attend this a bilingual—Spanish and English—workshop. Are you interested in helping us figure out how to water more efficiently and keep healthy planted yards? Do you live in the Inland Empire (see area included in the map below)? We have a new program, Operation Smart Water, and need your help. The goals of Operation Smart Water are to better understand how much water is needed to keep our outdoor landscapes healthy (front yards, parks, etc.). We know that it is important to not waste water and that outdoor watering is one of the biggest opportunities for saving water, but we also want to keep some level of plants in our outdoor spaces, especially where they provide important benefits (e.g. shade, fruit, esthetics, human health). There remain some big unknowns in setting outdoor watering schedules and doing some community science could help us (Chino Basin Water Conservation District) perform audits to help home owners and cities manage their outdoor watering. We have assembled an A-list team of researchers and local partners to do the research side of the equation. What we need are a few more places with the right kind of trees/yards to do the field research and more community members to help. Check out our Operation Smart Water page to learn more about the program. By helping with the field work – i.e. becoming a community scientist. Condition 2: We will need the person/group who manage the irrigation watering to allow us to change the watering schedule. The project will last 6-9 months and we would discuss the proposed watering schedule ahead of time. In some cases, the plants in the yard may become water stressed but we will manage the watering to not permanently damage the vegetation. Condition 3: The research team will need to be able to come into the yard and take measurements once a week. The instrumentation at each site will include soil moisture sensors, phenology cameras, and additional instruments to measure water infiltration, uptake, transpiration, and plant response. Ideally, we would have access to wifi. If you are interested in helping out with the field work–becoming a community scientists for the project–please let us know. Contact the Director at mchandler@earthwatch.org. Keep in touch with us through Facebook and subscribe to our monthly newsletter for regular updates on Operation Smart Water. Community science is a key element to the Earthwatch Urban Resiliency Program in Southern California. Partnerships between local residents and scientific researchers generates more research accomplishments and connects people from the coast to the desert in an environmental movement. 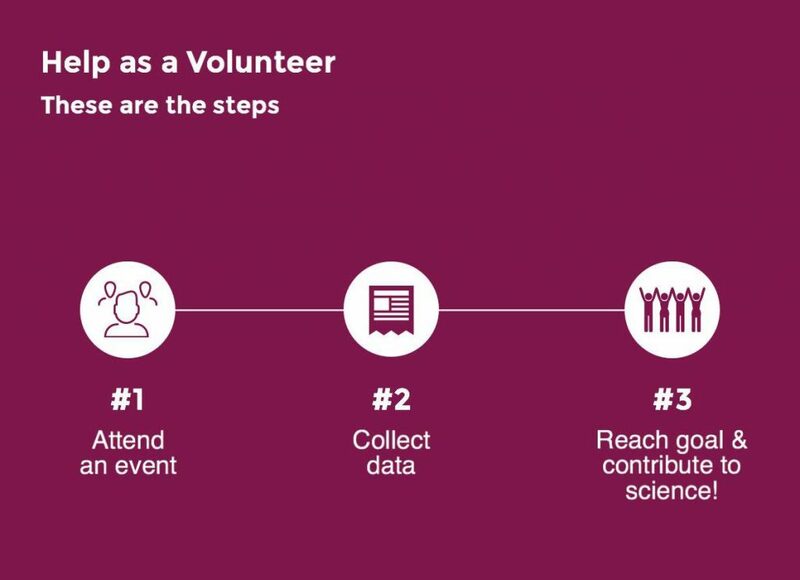 Volunteers make a direct contribution to scientific research, learn about trees, and gain perspective about the challenges of urban resiliency. The data is used by scientists at the University of California, Riverside to determine the water usage and cooling benefits of common urban tree species in Greater Los Angeles. The results help build urban resiliency in Southern California. Scientists gain access to a wider geographic area and connect the public to the vision behind the research. The data collected is used to further our research and to inform decision-making about how urban trees positively impact the LA region ecosystem. For Operation Healthy Air we are looking for community scientists and volunteers to kickstart our pilot sampling “campaigns” in Long Beach, and Chino, and the Inland Empire (e.g. Riverside and Redlands) in the summer of 2017. We will look to expand the program in 2018 to greater Los Angeles and other cities. Operation Healthy Air is a partnership between national and local partners, community-based organizations, Universities, Aquaria and government agencies, and community members. Scientists are doing research in Southern California and they are looking to people from local communities to help collect data about trees. Volunteer or become a Certified Community Scientist and help influence tree planting practices in your neighborhood and contribute to our global understanding of how to mitigate the effects of climate change. Looking for a more in-depth way of getting involved and/or want to collect scientific data on your own? 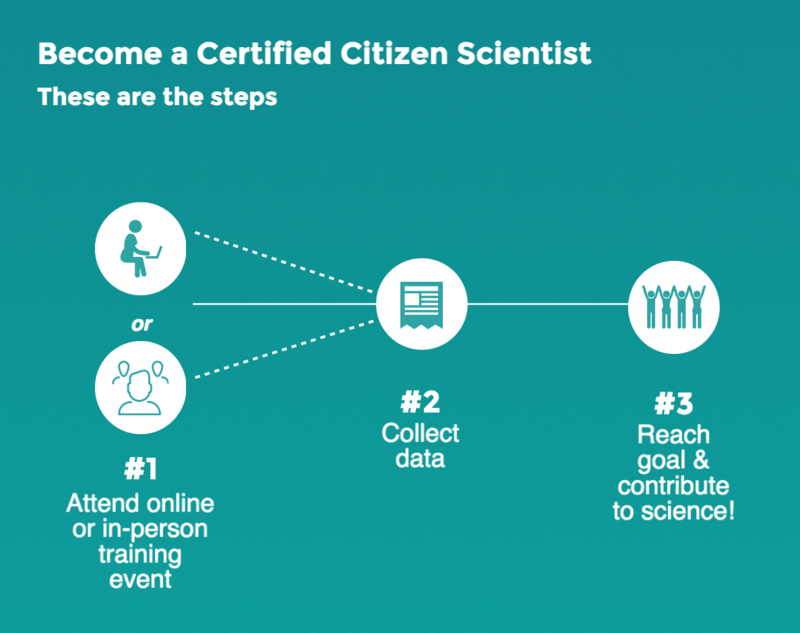 Join an in-person training event or go through our online training course to become a Certified Community Scientist. We plan to measure over 400 trees in 2017, taking detailed measurement of tree health, canopy and trunk size, GPS coordinates, and % permeable surface for 10 tree species that have widespread tree planting implications in our region. This program is a partnership between University of California, Riverside, Earthwatch Institute, and many Southern California nonprofits. The study region represents a massive 150 mile-long geographical gradient. Volunteers and Certified Community Scientists will play an essential role in collecting enough scientific data to draw meaningful conclusions on how these trees use water and provide cooling benefits in different regions. All 10 species are being considered as drought-tolerant trees, so understanding how each tree actually performs under different conditions will influence right tree right place planting practices for years to come. We need your help to be successful. The management of urban street trees, parklands, and forests is an integral and active part of urban planning to ensure vibrant green space, ecosystem services, and resilience for cities and municipalities. We rely on participants, educators, and partners to help spread the word and pitch in and help us record important data across the greater Los Angeles area and beyond. Sign up for upcoming events or organize a custom event for your group. 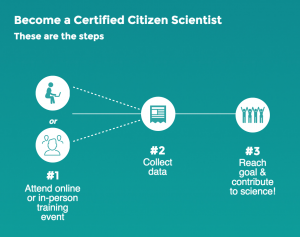 Become a Certified Community Scientist to learn how to collect research-grade scientific data independently. See what organizations are working with us.